In 1988, polio paralyzed 1,000 children every day. Last year it paralyzed just 33 children. Only two countries continue to report polio cases. Rotary’s progress in the fight to enpolio shows that vaccines work. 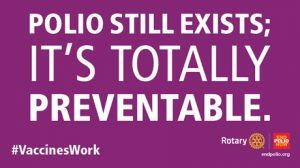 Through the effort to end polio, we now have found better ways to immunize children against diseases like measles, Ebola, and yellow fever. 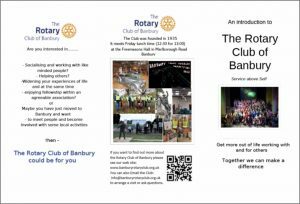 If you’ve ever wondered what Rotary does then read this updated leaflet about the Banbury Club. Better still – contact us and arrange a visit to see if you’d like to become a member.